The UK's vote to leave the EU has thrown a shadow of uncertainty over Europe's VC and startup ecosystem, in which the UK is a lynchpin. The UK has held a pivotal position in European venture capital as a hub for both investors and startups, and that’s particularly true in categories where it has been strong, including fintech, games, and biotech. The decision by UK voters to leave the European Union will have significant ripple effects on the VC landscape both in Europe and beyond. Here are the top concerns and likely impacts, according to early views we rounded up from investors, founders, corporate execs, government studies, and analysts. But first for context, here’s what the relative weight of the UK is in terms of overall investment in VC-backed companies in Europe. The UK drives a significant share of activity and dollar funding, so any major change in the UK’s relative weight in this picture would mean a significant shakeup. In the last couple of quarters, one-third of deals to VC-backed companies in Europe have gone to startups in the UK. In terms of dollar funding, the proportions are roughly similar. 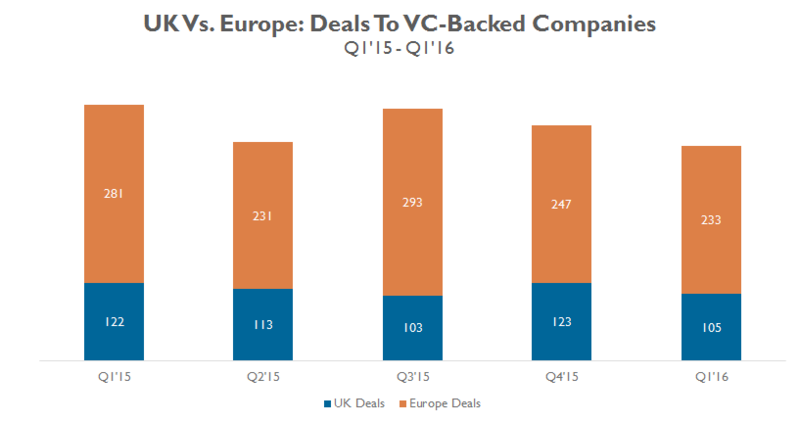 In Q1’16, UK-based VC-backed companies drew $1.3B in funding, while companies elsewhere in Europe drew $2.2B. Q1 2019 saw a decline in deals and funding but a record number of unicorn births. Download the CB Insights and PwC MoneyTree Report to see all the data. Here are the main worries hanging over London and the UK’s privileged place in the European tech and VC scenes. LP drawdown? There’s already concern that institutional investors who fund VC as limited partners will refrain from funding UK-based VC moving forward. One of the more significant investors in VC funds in Europe is the EU-backed European Investment Fund — which makes “cornerstone investments” in VC funds — and it would be expected to pull away from UK-based VC. “Our greater concern is the ability for venture capital to attract institutional money. The biggest investor in venture capital in Europe is the EIF, and if they scale back investment, that could have an extraordinarily cataclysmic effect on the industry,” said Tim Levene a founder of London-based VC firm Augmentum Capital, to CNBC. The EIF itself expressed “regret” at the vote and while it said it would not change its activities for now, it also made clear that big changes could be on the horizon. Similar concerns apply to foreign investors and sovereign wealth funds who may look askance at UK-based funds given the economic and regulatory uncertainty, said Hussein Kanji of Hoxton Ventures. Talent Exodus? The free movement of workers between the UK and the EU arguably made London into the top tech startup talent pool in all of Europe. The decision to leave the EU may cause a brain drain that could hamstring innovation in London. Fred Destin, partner at venture capital firm Accel, whose investments include food delivery company Deliveroo, said his main worry was the ability of companies to recruit talent. The “fluidity, speed and simplicity” of finding people from across the EU was a big advantage. He added that the leave campaign’s proposal to introduce an Australian-style points system was too laborious and slow for small companies. Keep calm, carry on: All that said, some voices are being raised to argue that the sky is not falling. London’s intense interrelatedness with the rest of the EU’s startup and VC ecosystems will mean that little will change in the next few years. London could fade as a fintech hub: The category most under threat is arguably London’s thriving fintech scene. As part of the EU, London’s advantages where clear: the status of London as a preeminent global finance hub, the abundance of European talent, and the uniformity of regulations that allowed London-based companies to easily roll out products Europe-wide. But now? With the Brexit, all the comparative advantages are thrown at least partly into question. 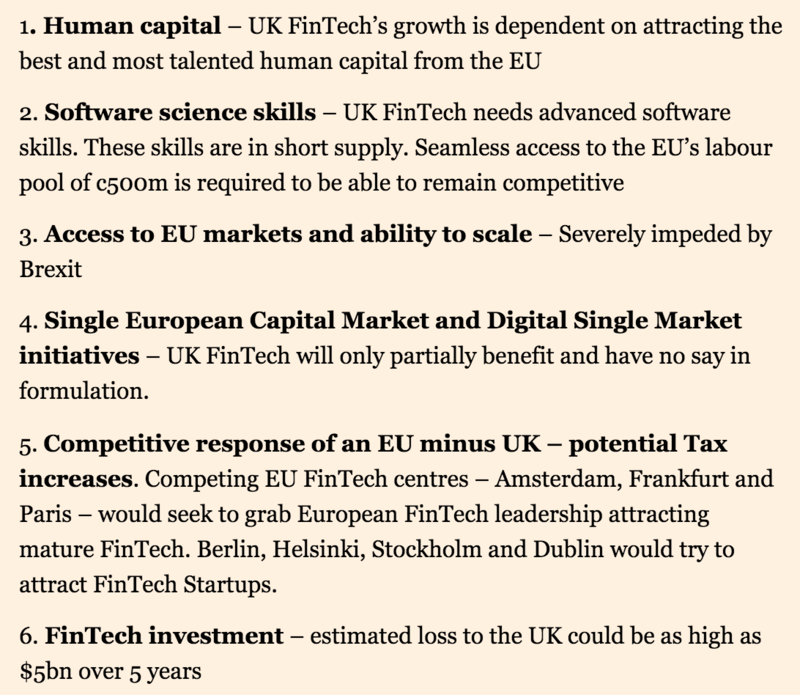 These are takeaways compiled by the FT on a Brexit impact report that had been together by London Fintech Week. Opportunity for other fintech hubs: Other aspiring fintech hubs some of which are already using tax breaks to lure fintech startups — including Frankfurt, Amsterdam, Dublin, Switzerland, and New York — could see more investment and entrepreneurship shift in their direction as London’s advantages are eroded. Just as one example, the low-tax city of Zug in German-speaking Switzerland is already known as a haven for cryptocurrency startups and Switzerland has been aggressively courting fintech companies. Germany’s startup ecosystem is expecting to benefit. Financial services incumbents may ditch London: Already, major financial institutions such as Morgan Stanley and JP Morgan have announced they are considering a relocation of investment banking and other key groups to Frankfurt, Paris, and Dublin. That may happen even before the so-called Article 50 process is begun by the UK (a multi-year process whereby the exit from the EU would be negotiated). Shifts such as these would hack away at London’s preeminence as a financial center overall, with negative knock-on effects for fintech. Morgan Stanley denies the process to relocate staff has BEGUN but will not wait for Article 50 to be triggered before making moves. Fintech startups look askance at UK market: Number26, a Germany-based bank startup, has already announced that it will scale back its plans to focus on the UK market in favor of expanding on the continent and EU-member countries. “It’s more likely for us now to focus on other markets. The U.K. market is still interesting, but … it’s not clear how regulation will play out or if we are willing to take the additional cost in entering the market,” said Valentin Stalf, founder and CEO of Number26. Similar concerns over regulatory uncertainty are hitting biotech, as after Brexit drugs would perhaps be regulated differently in the UK and in EU countries. “This does throw up some issues,” said Steven Bates, CEO of the U.K. biotech trade group the BIA.